This week I decided that my sewing cupboard was a mess, and that I wasn't going to let myself purchase any more fabric until I’d used most of what I had already. 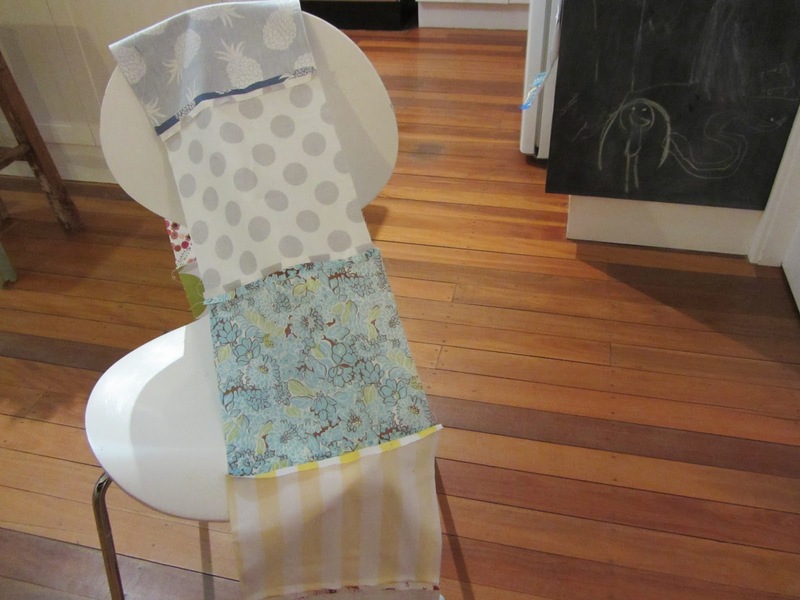 I needed a project that was going to be simple, and also one that used up heaps of fabric in one go! 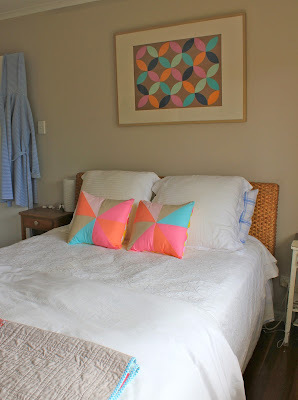 So I decided to make a beautiful quilt bed cover for our king-sized bed. This project was very simple. I didn't even use ONE pin! 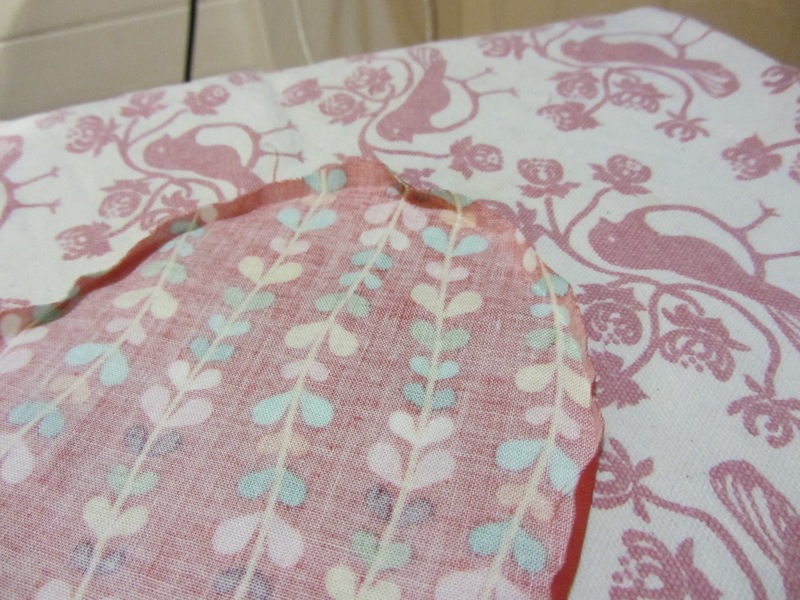 It did, however, take a little bit of time getting the whole thing sewn together. All up, I think it took me about 6 hours (includes cutting up the squares). 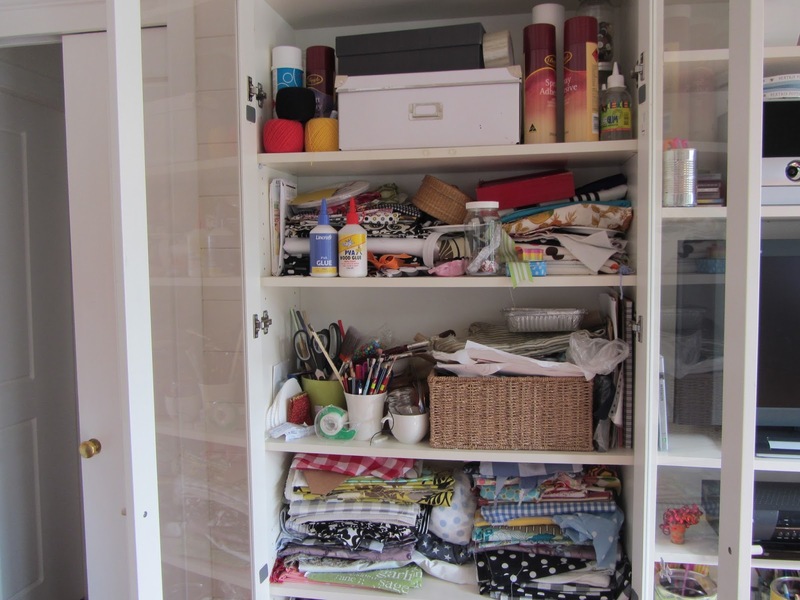 Firstly, I gathered all my material to ‘use up’. 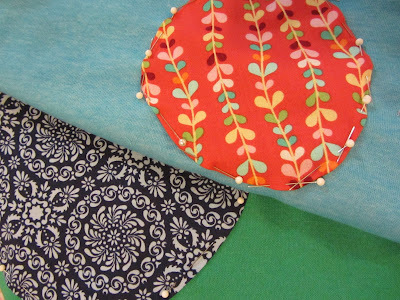 Don’t worry about matching any of the fabric, it will all work very well together once it’s sewn into the quilt! Then I found something square-ish to use as a template to cut my first square. I used one of my daughter Poppy’s little canvases and added a bit onto the side when cutting it out so it was the exact shape. 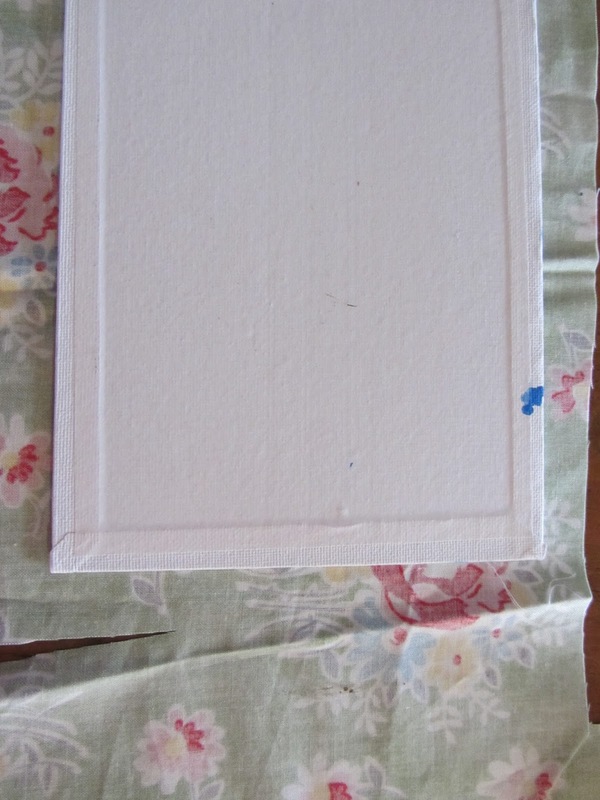 Once I’d cut one square the size I wanted (and allowing room for the seams in the size of the square), I then used this piece of material as a template to cut up the others. 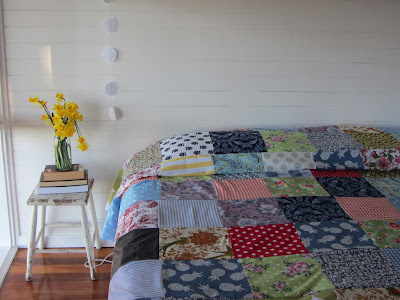 I decided I needed about 13 rows of 10 squares for our bed. If you decide to try this project, just cut one square out and then put it on your bed and roughly work out how many you’ll need. 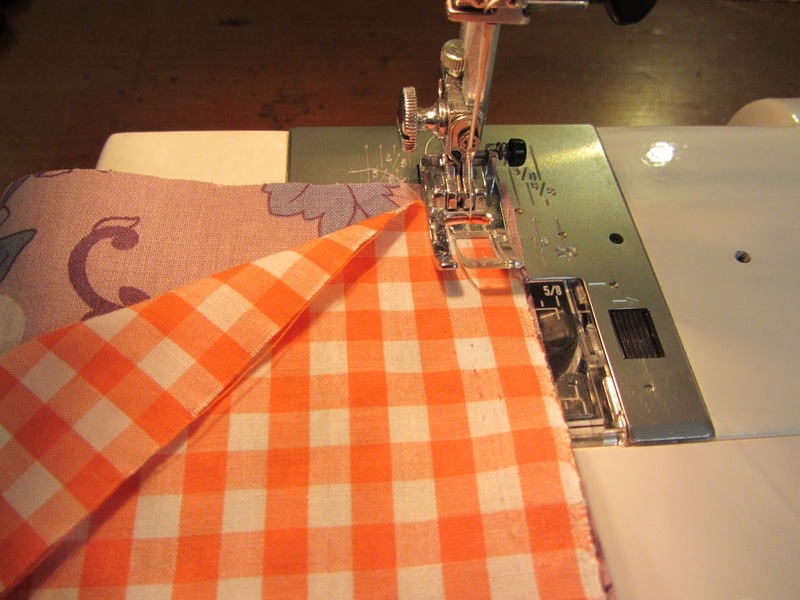 Once I had all my squares cut out, I started sewing them together. The easiest way to do this (I think!) 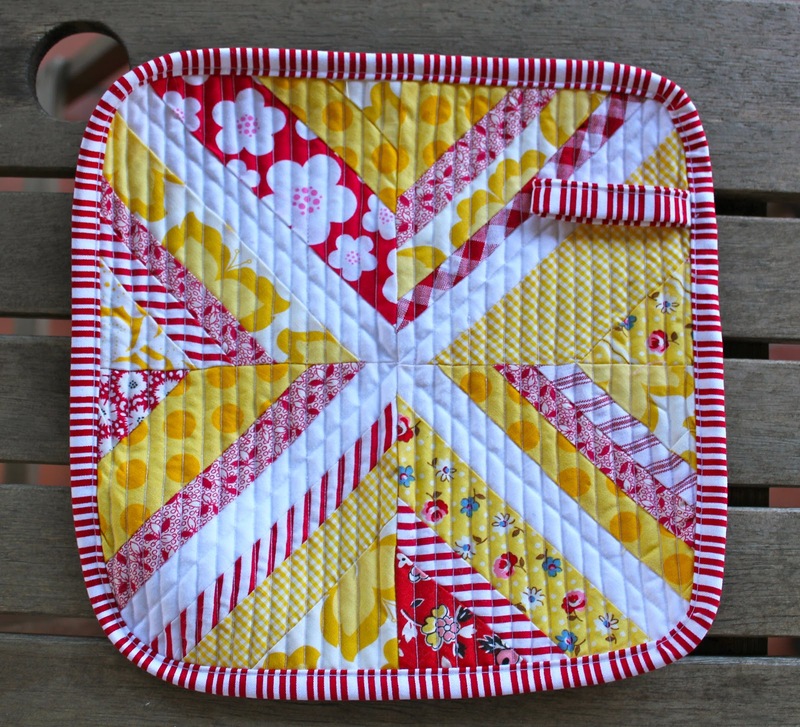 is to get one square, put it right-sides together with your next square and sew down one side of it. Don’t worry about pinning anything first, just hold the squares together with your fingers. Once you've sewn the squares together, fold them both open like a book. 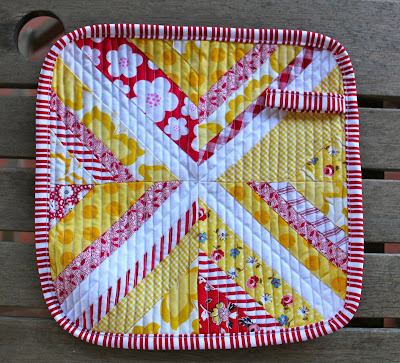 Then grab your next square and do the same thing onto one of those first squares you have sewn. Pretty soon you’ll end up with a long line of sewn squares. 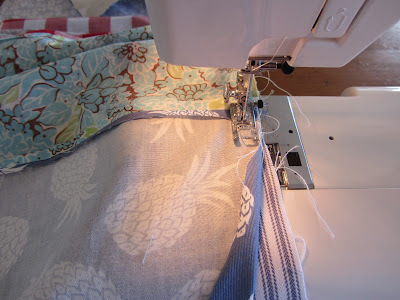 Once you've sewn as many as you need, move onto the next panel. I sewed 13 panels of 10 squares each (as I mentioned above). Then you’ll need to iron open the seams of each square (the sewn side only). This makes it easier and flatter when you come to joining all your panels together. Then it really is just a matter of joining each of these panels together. 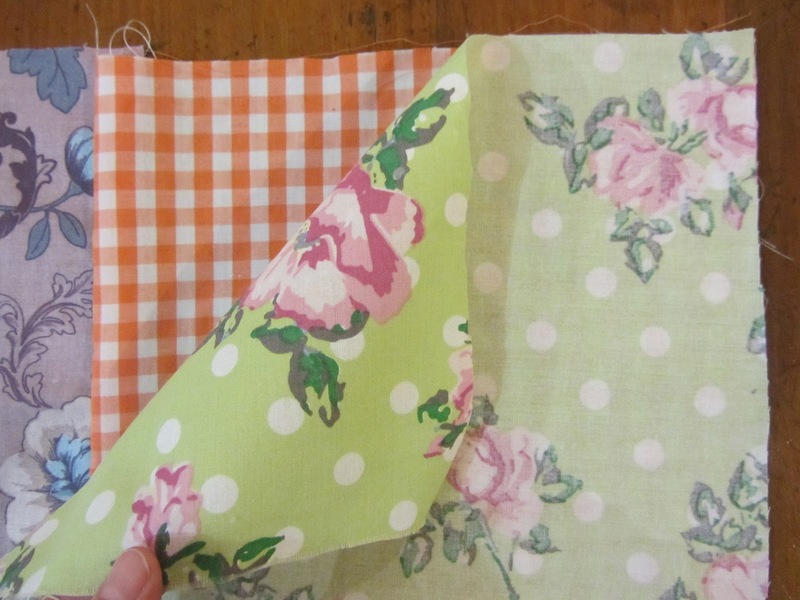 Match right-sides together again for the panels and away you go with the sewing machine! 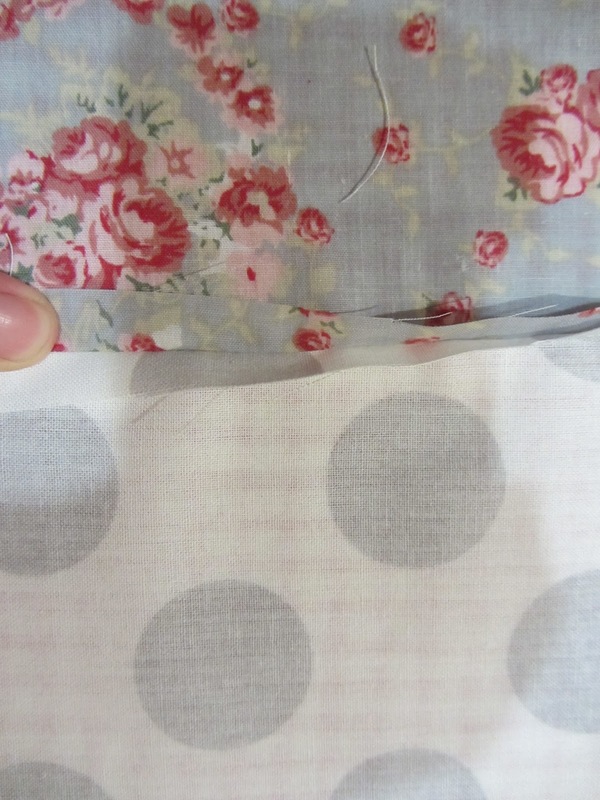 I found that not all my seams matched perfectly when I came to sewing all my panels together. But I didn't worry about it! It all looks good in the end! My plan for the back of this bed cover is to purchase a king-sized bed sheet next week (when I make it into a town somewhere), and sew it onto the back. I will again just put the right sides together, sew around them, then turn it out and iron it all down. Then I’ll sew up the remaining area (where I turned it out from) and it will finally be finished! 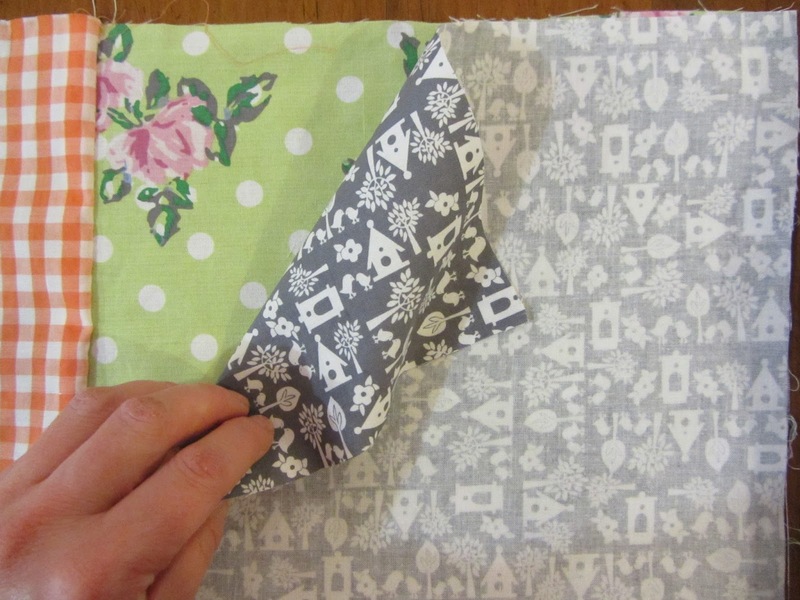 I hope you give this project a try – it really is VERY easy! 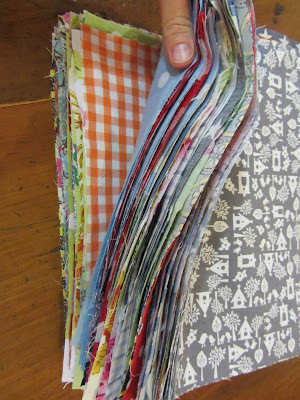 It also uses all your scrap material up very quickly! This week I was busy making some more of my little Travel Dolls. There have been so many new baby girls born in my world lately, so I needed a new stash of handmade gifts for them! 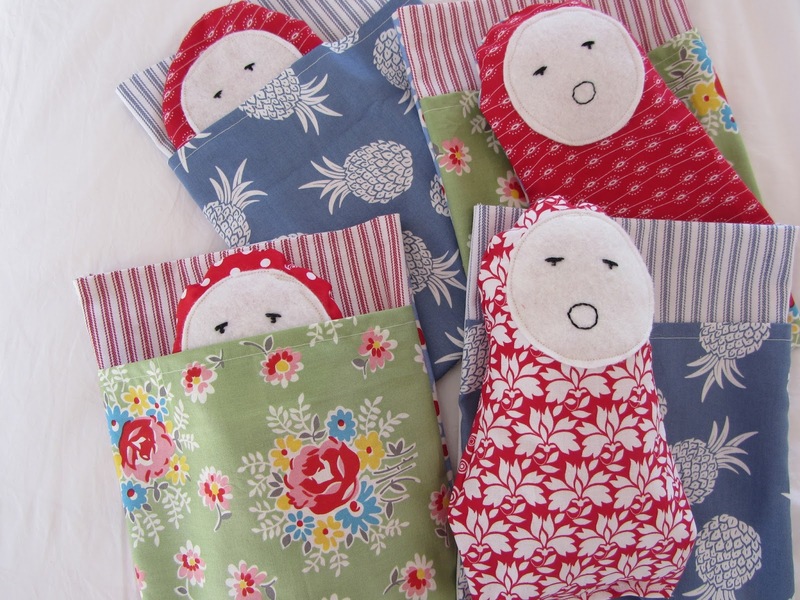 These Travel Dolls are an ideal present for a little girl. They can be used as a decorative cushion in a bedroom or as a doll and bed to play with and especially to take away for a night away from home. I have previously posted the step-by-step instructions on how to make these dolls – they really are very simple to sew. 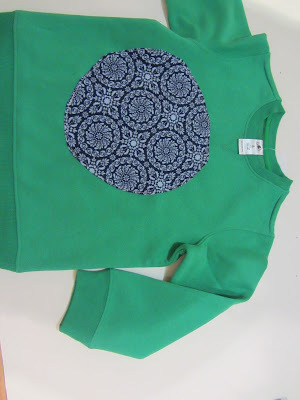 Hardly any sewing talent required at all! Enjoy your creative project this week, whatever it may be! 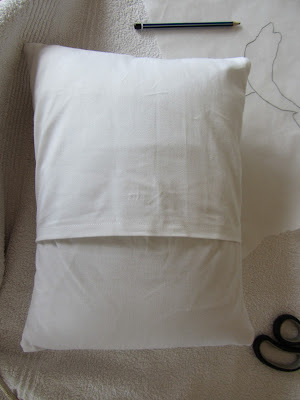 This is a really simple way to make some great cushions for your house. 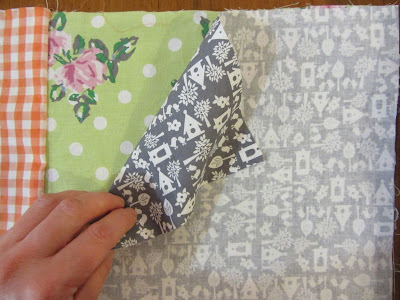 I simply cut 2 squares of fabric half an inch smaller than the cushion size you want to use (this gives the cushion that nice firm and plump look). 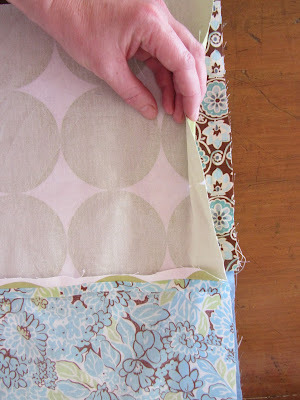 Sew around all 4 sides - leaving a gap of about 1/2 the 4th side open. This will give you the space to insert the cushion insert. 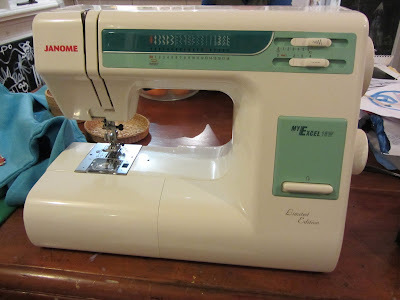 Then either hand sew or machine sew the seam shut. Finally add a simple fabric covered button to the centre of either side in a contrasting colour. I was looking through my latest fav home and design mag and saw these great pinwheel cushions. Nice bright bold colours and they looked amazing - but they were over $120 each - which is just crazy!!!! So I thought I'd just make some for myself! These are so simple to make. 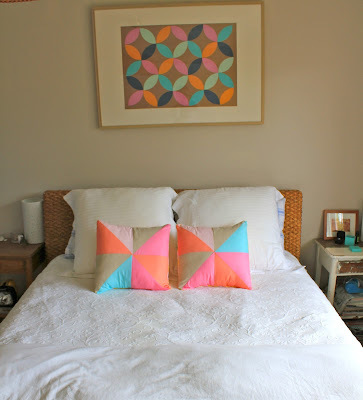 Each cushion consists of 4 half square triangles (HST) and I just used a variety of bright bolds and greys I had in the cupboard already. For the back just use Em's simple no-zip cushion tutorial if you don't feel like putting a zipper in! These really brighten up my spare room. Some cute little patches to freshen it up and it's a new top! 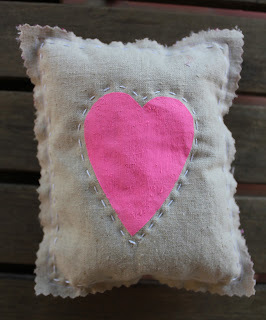 To make this I simply cut out 2 hearts from a furnishing fabric sample I had. 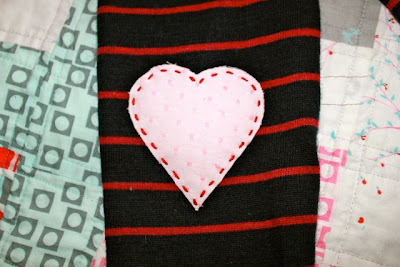 To attach the hearts to the jumper you can either hand sew with a button hole stitch, running stitch or machine sew with a tight zig-zag or satin stitch. I'd recommend using some flisofix or similar to attach the hearts to the sleeves first to make sure they are really secure. 2. I was too lazy to get the sewing machine out! (Sorry about the orientation of this photo! Blogger has decided yet again how my photos should appear!) You get the idea though! This weekend we were very excited to have a 5th birthday party of one of Poppy’s lovely little friends. There are so many beautiful “little girl” things around to purchase, but I wanted to give her something useful and practical. I also didn’t have much time this week so it had to be quick! 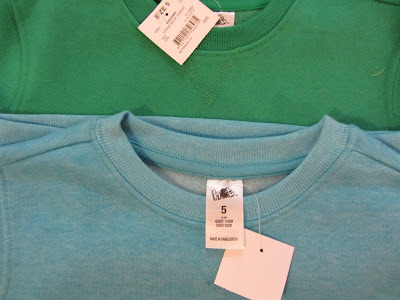 So I purchased two size 5 sloppy joe jumpers from Target, and gave them an easy makeover by sewing on some “dots” of pretty material. This project was very, very simple. 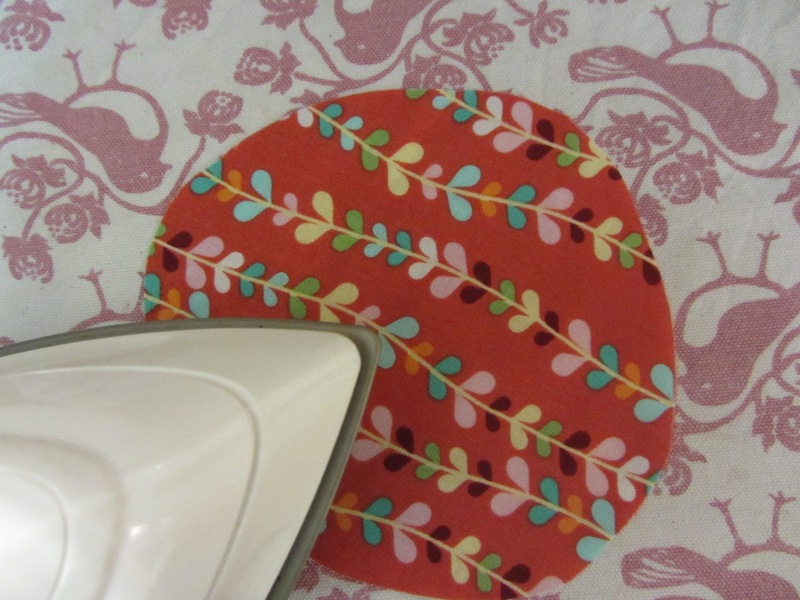 Firstly I cut out two round shapes from my selected materials and gave them a quick iron. 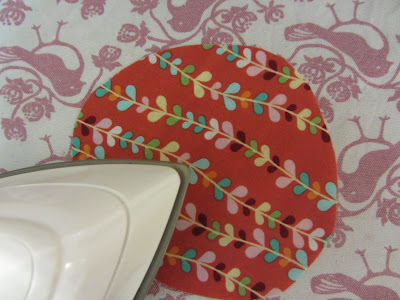 Then I ironed down a little seam. I pinned the material dots onto the jumpers in the position that I wanted them. And then it was a quick matter of sewing around them! It doesn't even matter if your sewing isn’t perfect – the messy look just adds to the appearance of the jumpers. The only problem was that the little girl I gave them to said “no, they’re too big”. !! She’ll love them though I’m sure! I love making children's toys so this week I have a simple soft elephant for you. 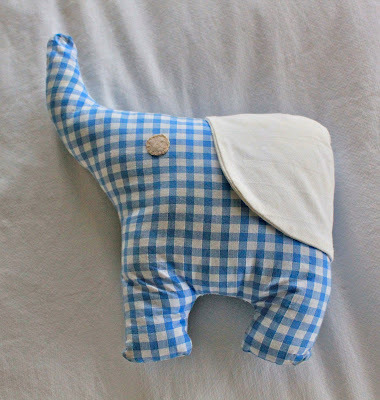 It reminds me of Emma's Easy-to-Make Soft Toy Elephant. This is a great project for a beginner sewer and will take you under an hour. I just drew up a basic elephant shape, similar to Em's and added a large ear in a contrasting colour that sits separate to the body. If you want to make this for a little one I suggest you use either appliqué or embroider a small eye on just to be safe, like I did. 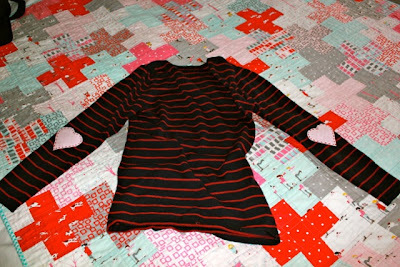 I made mine with a cute blue gingham check but I think it would be great recycling an old jumper or pair of jeans. 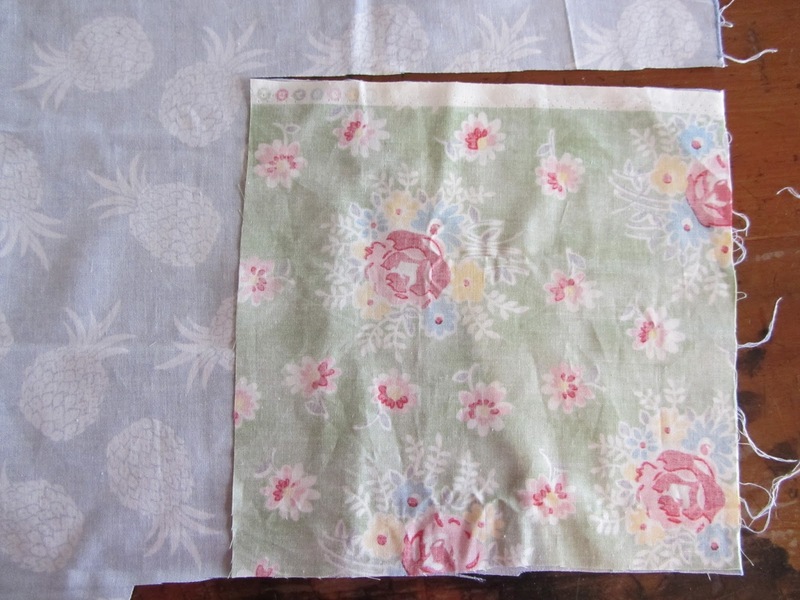 My friend Kat recently returned from a trip to Melbourne and bought me a pack of lovely lovely liberty cottons from Luccello. I haven't been, but looking on their blog (website coming soon) you can see just what an amazing place the store must be! Anyway, like a lot of you I find I really hate cutting up beautiful fabric sometimes. I just want to keep it and admire it. 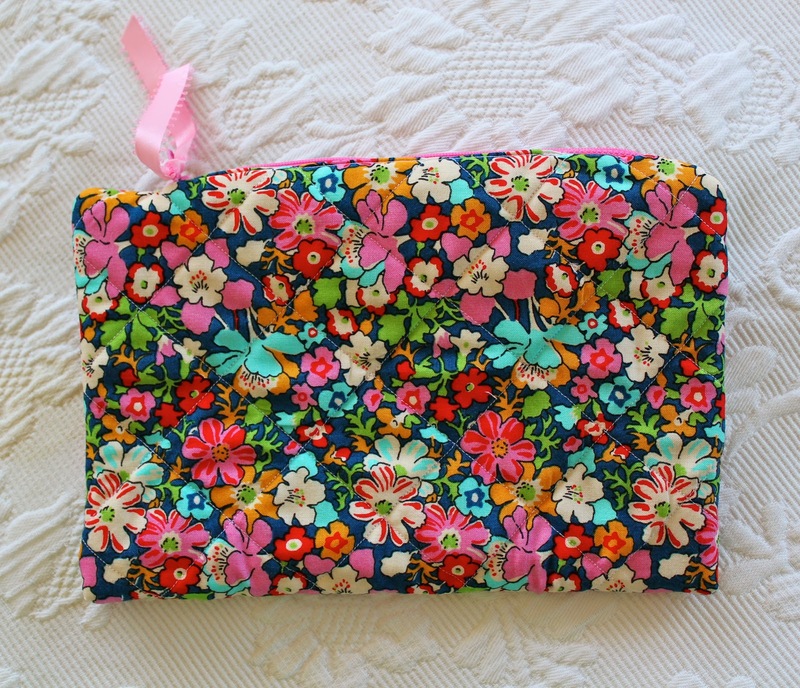 But I thought better of it and have made some sweet little purses that would be great for jewellery. They are padded with some left over wadding I had from quilts and then quilted so they are a little more protective for my jewellery. 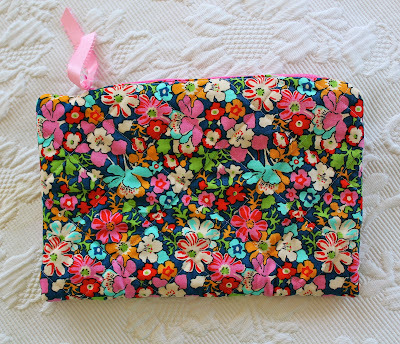 Don't you just love liberty fabrics! 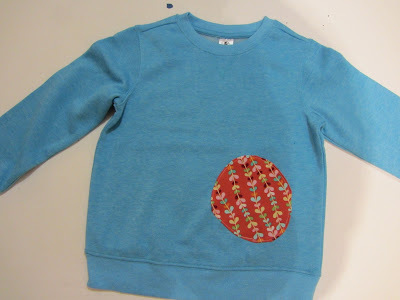 This project was very easy-to-do, and not much sewing skill was required at all! The concept is quite similar to another project that I did last year using children’s artwork. 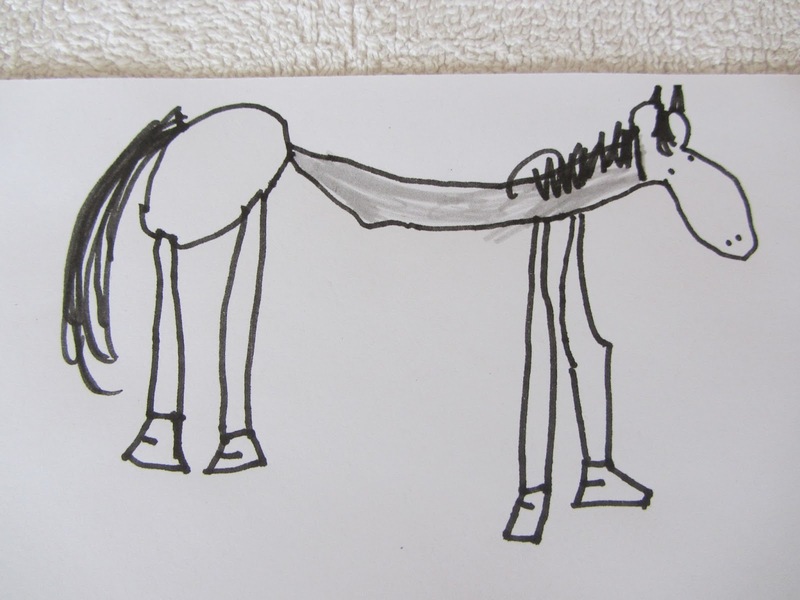 I just love the simple shapes and designs of the things that children draw. And it’s nice to try and use their pictures where possible, rather than putting them away in a drawer. Firstly, I made this cushion the same way as my No-Zip Cushion Cover, and I just made it out of different scraps of white material that I had lurking in my cupboard. The only difference with THIS cushion is that I put two pieces of material together to make the front panel, so that the front of the cushion was going to be strong enough to 'hold' the sewing. This is a view of the cushion from the back. 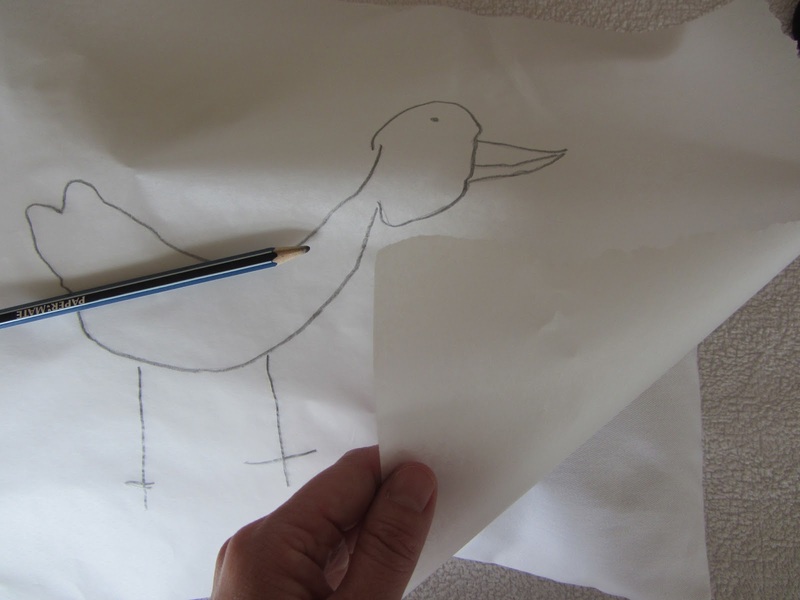 Then I chose one of my daughter Poppy’s drawings to use – the bird! 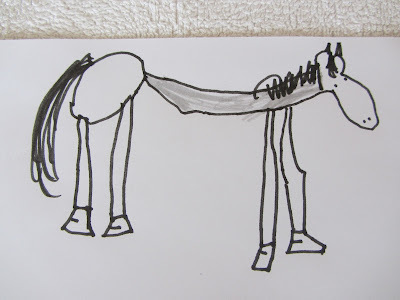 I’d also like to have a go at doing this horse too at some stage in the future. Isn’t it lovely? Just make sure you choose something simple, and something that will be easy to sew the outline of. So, I traced the outline from the original picture onto some tracing paper. Then I went over the outline on the other side, then flipped it over again and traced the outline again onto the material. 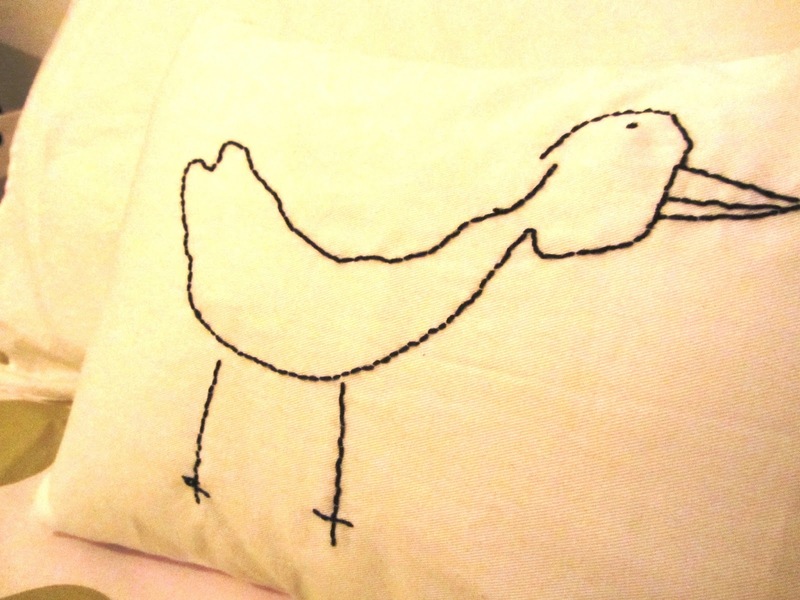 I had to go through this process so that the duck was pointing the way I wanted it to be on the cushion! Once I had the outline traced onto the material, it was just a matter of sewing over the pencil marks. I just used a basic cotton thread that I had purchased previously at Big W for one of my Christmas projects. 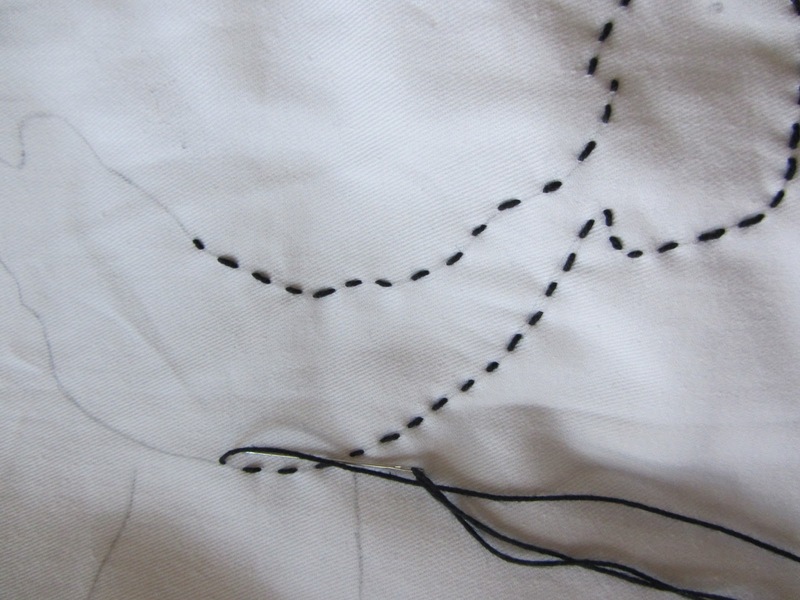 I went around once, sewing the outline, and then I went back over it and ‘sewed in’ the gaps. Not very technical, and I’m sure it’s not even the proper way to do it. Someone asked me, “is that called back-stitch?”, and I said “no, it’s called rough-stitch” !! And I’m very pleased to say that my cushion won a Highly Commended in the Handicraft at my local Show over the weekend. I have a good friend's little girl's 1st birthday coming up this week and was wondering what I should make for her. My inspiration came from my old dolls that mum has recently handed over to me - Coco on the left and Betsy on the right. You can see they are very 'loved'... especially Betsy which mum made me for my first birthday. This was a simple little dolly to make - took me all of one morning to make and is really cute - I have named her Ruby after my grandmother and I hope 'E' loves her as much as I loved my dolls! Firstly I drew up a pattern of what I wanted the doll to look like. 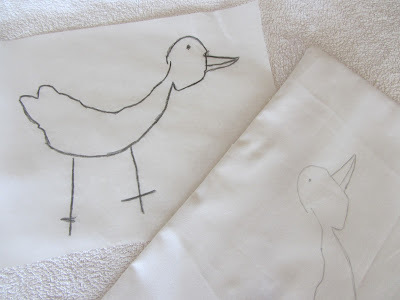 Next I traced each of the pieces onto some baking paper (noting that I needed to add seam allowance). Once each of the pieces was cut out I assembled the parts. I used felt for the hair and cheeks, a simple french knot for the eyes and back stitch for the mouth and ribbon for the bow. 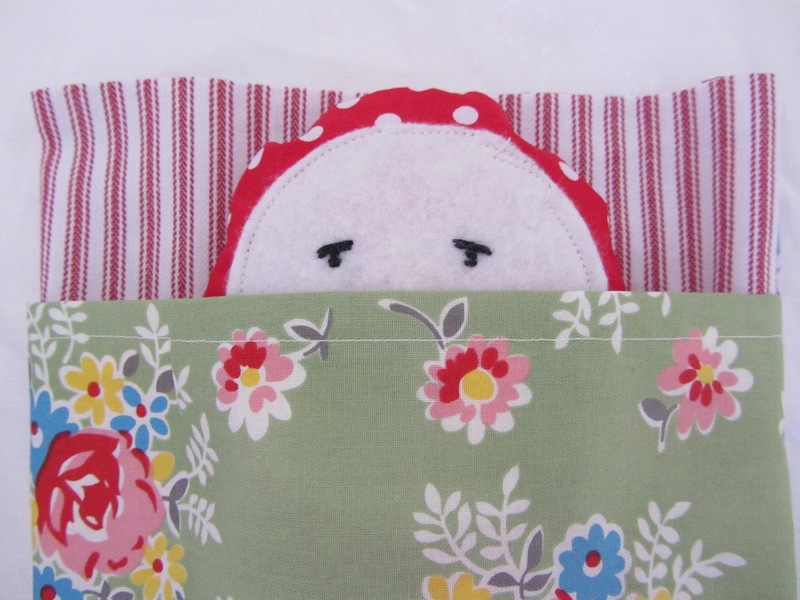 If you make a 'Ruby Doll' I'd love to see it or if you have any questions I'm happy to help! Anyway, I got a couple of little gift done today. I made this simple oven mitt using some string blocks I made a few months ago. I played around with the layout of the blocks trying to decide which one I liked best.. mmm this one's good..
but I like this option too.. I lined it with special heat proof wadding to ensure no one gets their fingers burnt and did some very close machine quilting before binding it in a matching red stripe! Love it... might make another one for my pending new kitchen! 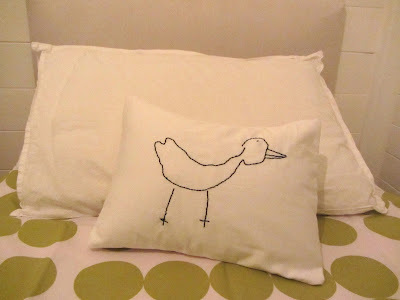 I also made a couple other quick gifts - firstly, a cute scented pillow. I used a hot pink painted heart I made back here and did a little running stitch around the outside before stuffing it with toy stuffing and a couple sprigs of rosemary from my garden. Rosemary is a great alternative to lavender if you want to try it - it's supposed to help with headaches, improve mental alertness and ease muscle aches and pains....personally I just love the smell! 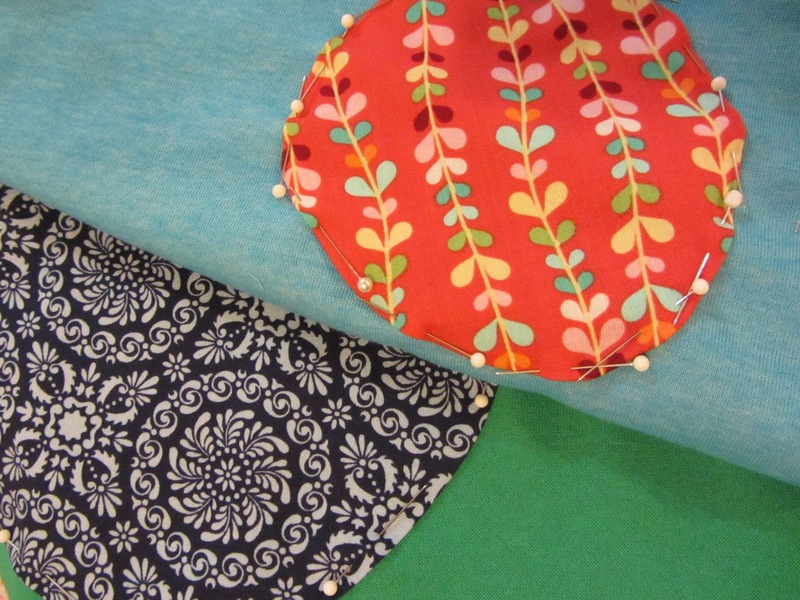 And some covered coat hangers similar to those I made back here. Well this is my last post before Christmas - I hope you have got lots of sewing done and wishing you a lovely Christmas with those you love.